A review copy was provided by the publisher in exchange for an honest review. All opinions are my own. Mark Alder is a nom de plume of Mark Barrowcliffe, an author whose books I have enjoyed in the past under another one of his pseudonyms, M.D. Lachlan. I’ve therefore had my eye on Son of the Morning ever since its initial release two years ago by the UK publisher, and it was with great excitement when I found out that the novel was finally going to be published here stateside by Pegasus Books in early 2016. Needless to say, I jumped at the chance to review an ARC of this reissue which will come complete with a brand new look, featuring Baroque painter Luca Giordano’s stunning masterpiece “St. Michael” gracing the cover. 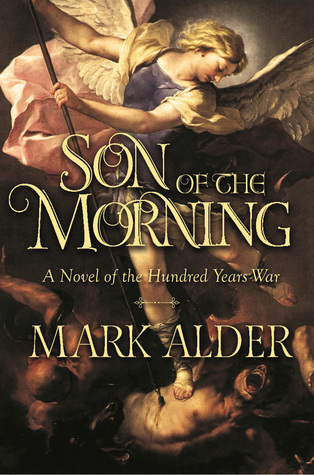 Summarizing the story in this 700 page tome would be a difficult task, as you can imagine, but for brevity’s sake, Son of the Morning can be described as the Hundred Years’ War with angels and demons. Alder combines history with a great number of fantastical elements, chronicling multiple plot threads and character journeys in this reimagined version of the Middle Ages, primarily focusing on the earlier decades of the conflict. This period sees King Edward III of England attempting to assert his claim as the rightful heir to the French throne by waging war on his rival King Philip VI of France. Both sides vie for the support of God and his angels, but it appears that the Almighty has chosen not to bestow his favor on either one. Appeals to the angels are met with silence, leaving both kingdoms desperately scouring the continent for holy relics or other artifacts that might aid them in the war. But if Heaven refuses to send aid, perhaps it can be found elsewhere…like in Hell. Tired and broke but still too proud to acknowledge fealty to France, Edward considers turning to the servants of Satan for the forces he will need to battle Philip, who is beset with troubles of his own. Meanwhile, a new Luciferian movement is sweeping through England’s poor and disenfranchised who are fed up with the notion that their God-ordained station is to be forever under the boot heels of the rich and noble. Its adherents believe that Lucifer is not actually the personification of evil, but that the Son of the Morning was usurped and wrongfully condemned. While mortal kings fight a holy war on earth, another is being waged by the denizens of Heaven and Hell and they are using our world and its politics as their battlefield. Son of the Morning is by no means an easy read, with its intimidating page count and a concept that sounds astonishingly ambitious and, quite frankly, a little mad. So I won’t blame you if you’re feeling a bit skeptical. However, I assure you it actually works quite well. For better or worse, the author manages to capture the atmosphere of the times, right down to the rigid feudal system and the theological influences on the attitudes towards the lower classes. It’s possible that God’s “order” of things might be even more ingrained in this alternate historical society where angels and demons are real. One can imagine how hard it would be to argue against these beliefs, when everyone has witnessed—with their own very eyes—divine beings taking orders from kings and winning them wars. Still, it doesn’t mean that the poor and the downtrodden have to be happy with this hierarchy. This is where the book’s world-building stands out, exploring religious arguments and coming up with its twist on Heaven and Hell. After all, how could God support a system that benefits the wealthy lord while his serf labors and starves? How could He smile upon the royals who do nothing but wage war while the poor in their kingdoms get even poorer? This couldn’t be the compassionate and righteous God, so it stands to reason that everything taught by the Crown and the Church is built on lies. A key character of this story is a youth named Dowzabel who comes from a religion that believes Lucifer was the true creator, and that God struck him down in his jealousy and stole his place in Heaven. So now this world’s Hell has two factions, Lucifer and his legions of demons who are separate entities from Satan and his devils, who are servants of God. It’s important to understand this distinction when trying to follow the story, and admittedly it could take some time to fully wrap your mind around the complicated lore and nomenclature. Medieval history is also not my strong suit, and my knowledge of the Hundred Years’ War is decidedly patchy, meaning I had to pause frequently while reading in order to get all these people and events straight in my head, especially when practically every other character is named Edward or Joan. Wikipedia was my constant reading companion. But this was just my personal experience; if you’re a history buff or a fan of this particular period, you probably won’t stumble around as much as I did. It helped that the story was overall very riveting, even though the pacing in the first half of the book was slower and uneven while the narrative was busy filling in the necessary background information and establishing the key players. Son of the Morning being such a lengthy novel, this means getting to the good stuff does require a fair bit of commitment on the reader’s part. I’m also not entirely convinced that the book needed to be so long. I’m certainly no stranger to these epic fantasy doorstoppers, but I did suffer a little from “long book fatigue” by the end of this one, because quite honestly, I think this story could have shed a couple hundred pages and it still would have ended up just as good. Bottom line, there’s a good chance fans of historical fantasy will love this book, particularly if you enjoy stories set in this time period, but Son of the Morning will pull you in even if you don’t know much about the Hundred Years’ War. Mark Alder has achieved something really special here, breathing new life into historical events and figures by smoothly integrating them with theological and speculative elements. A highly captivating read. Hmm, interesting. Just a little intimidated by the length of it! Yeah, I can see the size of it scaring people off. A shame because it’s actually very interesting, and if it had been edited down to a 300-500 pages I think it would have worked just as well. I remember this got really high praise by people in the UK when it first came out. I didn’t realize it wasn’t released in the US yet, but now that you’ve reminded me, I may have to check it out. It is long, but I temd to prefer that in historical fiction. Wow! This is intense!!! I’ve not read much historical fiction, but it sounds like I should. I love historical fiction, especially with fantasy elements. I had a good time with this one, especially since it refreshed/taught me a lot on the Hundred Years’ War! My copy is glaring at me from a pile, as it’s crushing all the books beneath it. 3 1/2 stars is not making me jump up and down and knowing it’s slow and long means I may not get to it very soon. Yeah, I found it slow in the beginning and for me the story probably didn’t take off until maybe the second half. The world building is really fantastic though, and if you have interest in the time period/The Hundred Years’ War maybe you’ll have an easier time with the first half! I adored The Shards of Heaven! This one is similar, in the idea of blending fantasy elements with real events, places and figures. The tone differs dramatically though; I would say the historical details are much richer in this book, though it also made it a heavier and more difficult read. At least we know those pen names belong to him! It drives me crazy when I come across a pseudonym and I don’t know who it is. Alex Marshall, anyone? I did not know that…who is he?? No clue! That’s what’s driving me nuts because I want to know. They’re keeping this secret pretty well. Yeah, describing my knowledge as ‘patchy’ would probably be quite generous! Such a huge book and no doubt loads to take on board. I’d probably be more inclined to pick this up if it had a really glowing review – 3.5 stars seems to make it a more daunting prospect. That being said, if I see it when I’m out and about I’d probably pick up a copy but I just won’t rush out to do so. This sounds so interesting but probably too much of a heavy load and involved for me. I’ve turned into such a slow reader lately 700 would kill me, I’ve spent a month trying to finish the The Name of The Wind audiobook now. But kudos to a book that would take such a heavy load of Biblical and European history to weave it into its own myth.